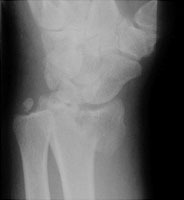 The reverse Barton fracture refers to an intraarticular fracture through the distal radius. 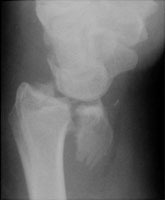 Although it is similar in appearance to a Smith fracture, the Smith fracture is not intraarticular. The reverse Barton fracture involves the volar rim of the radius while the conventional Barton fracture involves the dorsal rim. The fracture is caused by direct trauma. A Lateral radiograph of the wrist. This shows a displaced fracture of the volar rim of the radius. B Oblique radiograph of the wrist. The intraarticular nature of this fracture can be appreciated.